Home Books Sales and Discounts Great Books for Only 20 Pesos! Great Books for Only 20 Pesos! Do you know that you can get your dream book titles for ONLY 20 PESOS? Sounds impossible? 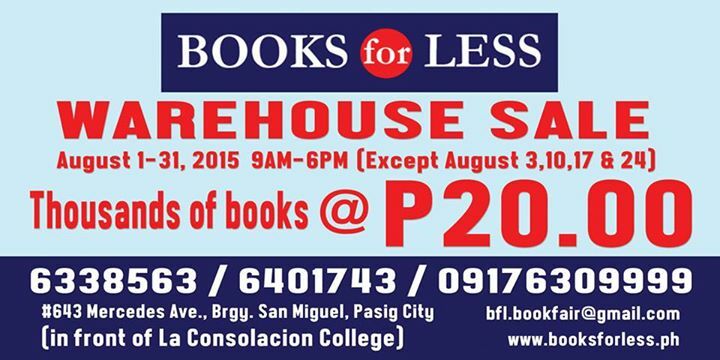 Well, it is no longer impossible as Books for Less brings us their Grand Warehouse Sale from August 1-31, 2015. So what will you find? There are literally thousands and thousands of books displayed at the warehouse just waiting for you to buy them. It is a big warehouse where that favorite book of yours might just be lying around. Don't expect to be all comfy while searching for your book and don't expect it to be organized per genre. Since this is a warehouse sale, it might be a bit hot and a bit different from your mall experience. 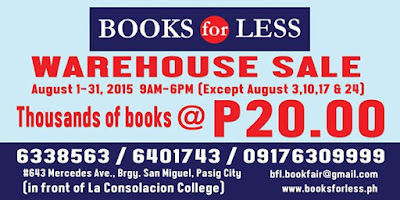 The Books for Less Warehouse Sale runs from 9am - 6pm till August 31 except August 3,10, 17 and 24. We advise you to bring something to put the books in since I am sure you might buy a lot of them. Imagine how many books your 500 or 1,000 can buy... hmmmm... that's a lot! Thanks for a fellow blogger Fox of "We Park and Ride" for sharing this wonderful place.